DETROIT — As a Donald Trump supporter, Nedal Tamer feels he’s in the minority among Muslim-Americans, comfortable with his choice yet somewhat confounded that he doesn’t have more company. 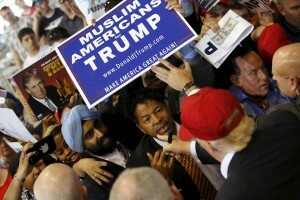 Small numbers of Muslims find comfort, not concern, in Trump’s strong stance on immigrants. They see it as proof that the Republican presidential front-runner could better contain extremists than other candidates. Tamer was born in Lebanon and immigrated to the U.S. in the late 1990s from the United Arab Emirates. He said Trump is speaking about extremists, such as the Islamic State group and those it inspires, not all followers of the religion. In heavily Arab and Muslim Dearborn, many support Democrat Bernie Sanders, and people in those communities helped turn the tide toward him last month in the state’s primary. Sally Howell, an associate professor at University of Michigan-Dearborn and author of several books on Arabs and Muslims in Detroit, described them as a small demographic overall but certainly a factor in Sanders’ Michigan victory over rival Hillary Clinton. It helped that he came to Dearborn to court them. That’s not stopping some Muslims from organizing on behalf of the GOP and, by extension, Trump. Last fall, Saba Ahmed founded the Republican Muslim Coalition in the nation’s capital and seeks to establish a presence nationwide. “We will be supporting whoever the Republican nominee ends up being. And we are hopeful of Trump’s business background, and that he would be able to use that to turn the economy around,” she said. Osama Siblani, publisher of the influential Arab American News, said Trump’s supporters – Muslim or otherwise – believe he is an “independent thinker” who “will do the right thing at the end of the day.” Siblani added that Trump has business enterprises all over the world, including in Arab Gulf nations, which supporters believe should mute concerns over Islamophobia. Still, Trump is neither Siblani’s personal preference nor his paper’s. The Dearborn-based publication, which supported George W. Bush in 2000, has endorsed Sanders. “I believe Trump is playing on ignorance and cashing in on fear,” Siblani said. Associated Press writer Noreen Nasir contributed to this report.